This past week, the kids and I were invited to spend a few days in Detroit with Visit Detroit. The travel bureau suggested we stay at the Courtyard Marriott which is traditionally a hotel for business travellers. I figured it would be worth checking out and off we went. 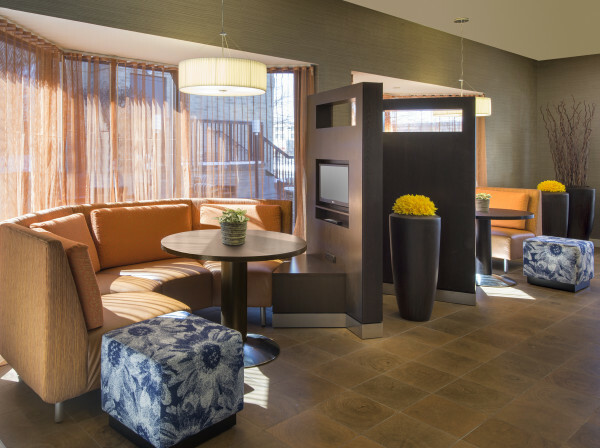 Here are 5 reasons you should consider staying at a Courtyard Marriott with your family. I’ll admit it. We travel all the time. I am tired. My house is usually a mess. I love walking into a spotless hotel room and enjoying the fact that I will not be responsible for cleaning it. From the moment we entered the Courtyard Marriott in Southfield, I noticed nothing was out of place or dirty. Even the lobby of the hotel was spotless. Our room was large and clean with a lot of extra room. Due to the fact that they cater to business travellers, the rooms have sitting areas to work and desks. A plus when you want to separate your kids from each other for a little while. At any business hotel, the staff is used to catering to people who are in a hurry. The Courtyard Marriott in Southfield has this down. In the morning, business travellers were picking up pre-packed breakfasts and rushing out the door which the staff handle with ease. Both mornings we sat down and enjoyed a quick breakfast of fruit and muffins without having to go to a fast food restaurant. The check out process was completely flawless and not a single error was made in billing. The staff is used to return customers and thus customer service is key to their success. We were treated so well that I didn’t want to leave. 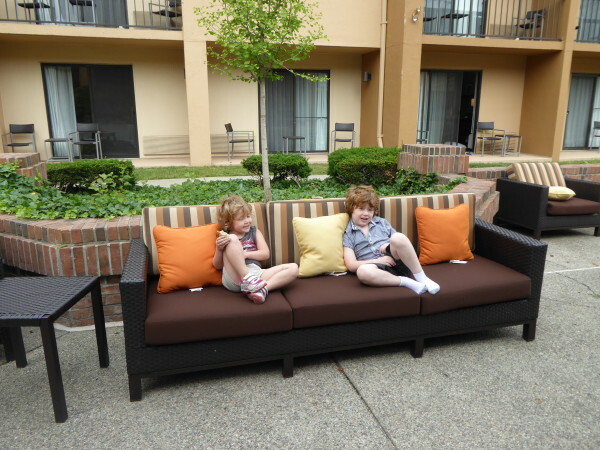 I felt a little weird staying at a Courtyard Marriott with my kids because I was worried my adorable little travellers might bother people. In fact, the opposite was true. Business men and women who were away from their own kids loved having a quick chat with Charlie and Will. One night I settled down in the lobby (more on this in a second) to get some work done, and the staff loved talking to the kids. I was a little stressed about the kids being in the lobby and a manager noticed this quickly. She came over and let me know that our family was welcome in all parts of the hotel and encouraged the kids to try out the new technology screens in the main lobby. It was a very nice moment. Courtyard Marriotts across the U.S are being upgraded to reflect the modern traveller. The lobby in this hotel was amazing. There was a modern bistro with great booths complete with a small television and plugs for my computer. The old idea of hiding away computers in a business centre has been modernized into a nice open section of the lobby. There is also space to just sit and relax by a fireplace or near a big screen television. Before this stay, I have never spent more than 20 minutes in a hotel lobby. I would estimate we spent at least 3-4 hours in the lobby over a two night stay. Unlike some family hotels, the pool in this hotel was extremely quiet. We swam twice daily and rarely encountered another swimmer. The best part was the pool was a salt water pool. The kids loved swimming for hours and I was quite pleased my eyes were stinging from chlorine. There was also a great jacuzzi tub next to the pool so I could supervise my kids while being able to take a moment to relax myself. A lot of people have asked why we didn’t stay in downtown Detroit. As this was a press trip, we were assigned the hotel we stayed at. I was wondering before we went if it would affect our stay to stay outside of the downtown area. It in fact did but not in the way you would assume. First, it was a quick drive to and from the downtown core. The kids actually got to see a lot more of Detroit because of this. Also, it was really nice to leave the downtown core and have some peace and quiet. 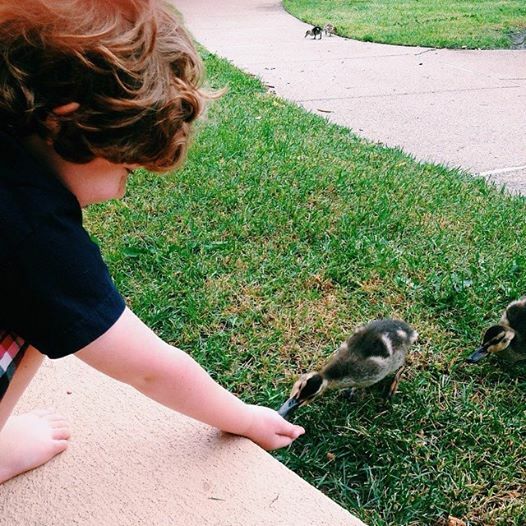 There was a family of ducks living in the courtyard of the hotel and it was nice to sit outside by the fire pit at night. Lastly, I was able to park my car directly outside the hotel room and quickly grab anything I forgot to bring in the room. Not easy to do with two kids and the parking garage situation which you find in most downtown Detroit hotels. 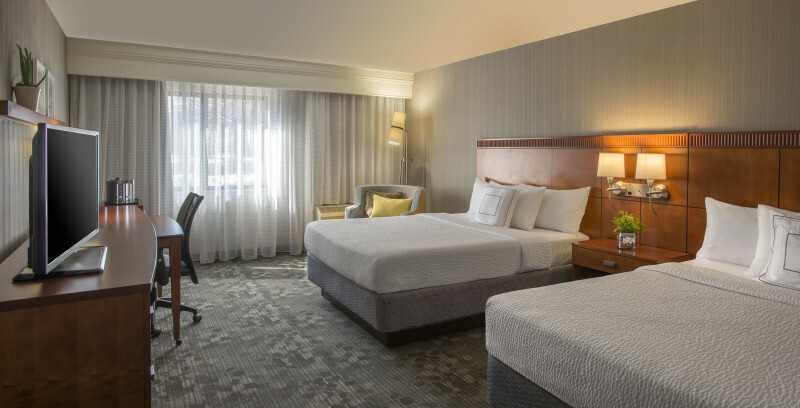 If you are considering taking your family to Detroit any time soon, I would seriously consider staying at the Courtyard Marriott in Southfield. Disclaimer: We were hosted by the Courtyard Marriott Southfield and Visit Detroit. The opinions expressed above remain my own. I love Courtyards! I don’t have kids, so I can’t speak to having that experience, but as a solo travel for both business and pleasure I always love staying at Courtyards. Marriott is my hotel chain of choice for points purposes, and I stay at Courtyards a lot with my kids. Love them — always clean, reliable product, and reasonably priced. I’ve never had any trouble getting a Pack N Play for my little ones when we needed it, and I love that they often have rooms with king beds plus sofa beds — perfect for mom and dad to spread out and for the kid(s) to have their own space too.